Enough with the jabber about this basketball thing, “sheets of integrity” and other such nonsense. It is time for the real college tournament to begin, and it promises to be one of the most competetive tournaments in recent years. Teams that dominated their respective conferences during the regular season struggled in the conference tournaments, giving some surprising teams an automatic berth. One small disclosure item before we begin — my son attends Miami University, and is in the band, which those of you familiar with the venue will recognize as the “ringleaders” of the crowd at the Goggin Ice Center. Nonetheless, I promise to be objective and fair in my assessment of the tournament. Honest . . . really, I mean it . . .
none of this year’s tournament teams, while Denver is 7-5-1 against the tournament field. The other East matchup pits New Hampshire and Cornell, which should be a case of the irresistable force (the New Hampshire offense, led by Butler’s 50 points) against the immovable object (Cornell goalie Scrivens, with a 1.78 GAA, and 7 shutouts). Cornell is 7-2-1 over its last ten, and appears primed for success in the tournament. The bet here is that they take inspiration from their basketball bretheren and topple New Hampshire. The run ends there however, as I have Denver overcoming Cornell on Saturday to earn the East slot in the Frozen Four. Moving out West, we find a bizarre regional draw, where all four members hold At Large bids. Wisconsin faces Vermont in the first round, while St. Cloud State battles Northern Michigan. Wisconsin has been on an offensive tear, posting a 3.97 GPG average, and has four players with 40+ points. In contrast, Vermont has no players above the 40 point line, and struggles in the goal production department, averaging under three goals per game. On paper, this should be no problem for the Badgers, who are 7-3 in their last ten. The other opener promises to be a bit tighter, with Northern Michigan coming off of a run that took it to the CCHA championship game . They are 8-2 over their last ten, and appear to be finding their game. St. Cloud has struggled of late, going ony 4-5-1 in the last ten contests, but has a lot of offensive punch, led by Roe and Lasch, each with 46 points. The schools share comparable records against the tournament field, and the bet here is that St. Cloud regains its form to edge Northern Michigan. For their trouble, they earn the right to fall to Wisconsin on Saturday, as the Badgers will head to Ford Field. In the Northeast Region, Hockey East tournament champion Boston College leads the seeds, facing Alaska in the opening round on Saturday. BC has been smoking hot down the stretch, posting an 8-1-1 record to the wire. Alaska has been no slouch either, going 7-2-1 over that stretch. Boston, however, packs a big offensive punch, lead by Atkinson (46 points) and Gibbons (44), amassing a 3.87 GPG average. Alaska has struggled to a 2.82 GPG figure, and will be hard pressed to keep pace. BC has relied on the goalie tandem of Muse and Milner, who have posted similar numbers. Netminder is where Alaska may have an edge, as Greenham, just a sophomore, has 4 shutouts and a 2.00 GAA this year. While he could keep the game close, Boston College prevails. In the other first round matchup, North Dakota faces Yale, who sports the only squad in the tournament with a GPG average above four (4.09). Yale, however, surrenders almost three goals per game, and has done so against suspect competition, as they have only three games against the field this year, though they did go 2-0-1 in those contests. North Dakota has gone 9-1-0 in its last ten, and has been riding the goaltending of Eidsness, a sophomore with a .915 save percentage and a 2.09 GAA. He will prove to be the difference as North Dakota moves on to the regional final. I also give them the edge over Boston College in that contest, with Detroit being their next destination. Finally, the Midwest Region hosts overall # 1 seed Miami University, who will face surprise entrant Alabama-Huntsville in the first round. Alabama posted only a 12-17-3 record, but got hot during the tournament and comes in with the automatic bid from the CHA. Alabama is 0-6-1 against the tournament field this year, and will be hard-pressed to change that against the Redhawks, who may have the most balanced and deepest lineup in the tournament. They have two sophomore goaltenders (Reichard and Knapp) with GAAs under 1.90, save percentages over .920 and nine shutouts between them. On offense, they have three forwards north of the 40 point line, and a fourth with 39 points. Though Reichard struggled in two games down the stretch, the bet here is that he finds his game. If not, Knapp is right there to take over. The Redhawks should have no problem with this one, as long as they are not caught looking ahead. 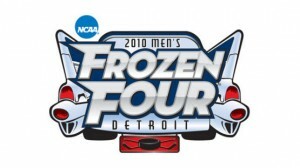 At Ford Field, Denver will face Wisconsin and Miami will face North Dakota. I predict that the string ends for Denver, as Wisconsin’s offense will ultimately carry the day. Similarly, North Dakota will struggle to solve the Redhawks’ defense and goaltending. So, it will be Badgers vs. Redhawks in the championship game on April 10 in Detroit. Both schools have great offenses, and both posted eight wins against the tournament field this season. Miami needs to find balance between a physical game and the need to stay out of the penalty box, their major Achilles’ Heel this year. Wisconsin will need to protect the puck and avoid the deadly Redhawk transition game, and will also require a huge performance in net. Last year, Miami was 45 seconds away from the National Championship when disaster struck, due to a lethal combination of nerves, lack of experience and bad luck. This year, they endured the loss of their team manager, Brendan Burke (son of Toronto GM Brian Burke), in a car accident. The entire team attended the funeral, and CCHA Coach of the Year Enrico Blasi did a nice job keeping the team’s focus where it needed to be. Their resolve has been sorely tested by the crucible of adversity, and that resolve gives them the edge. The call here is that the 2010 National Champions will be the Miami Redhawks. See? I told you I’d be fair . . .